The eternal problem of fighting over a spot on the couch might soon become a thing of the past with the invention of the three-storey sofa. The sofa, which comfortably seats nine adults has been inspired by stadium style seating at Wembley Stadium. It also comes with a smartphone holder, complete with an in-built charger, as well as beer-resistant upholstery. The prototype has been created by mobile network provider, EE. According to a survey of 2,000 sports fans, 51 per cent would prefer to watch sports with friends in someone’s home rather than going to the pub. For more than half of those surveyed, watching sports at home was more comfortable and a third want to avoid being covered in beer during celebrations. 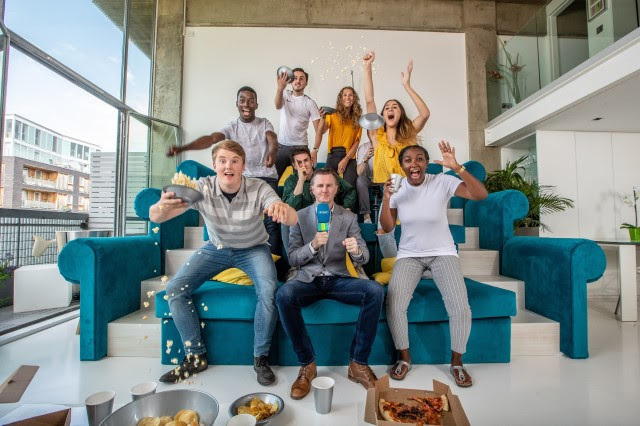 It also emerged that six in 10 enjoy playing host to friends and family to watch big sport events at their home with lots of snacks and plenty of drinks on offer considered key. Enough seats for all guests is also important along with having surround sound and good WiFi.